Having moved into an abandoned haunted house, the narrator, undaunted by the warnings of the locals, invites a party of friends over; on Twelfth Night he and his guests gather together, and relate the supernatural experiences they have had. 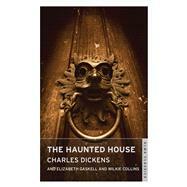 The resulting ghost stories thrill, shock and amuse by turns. For this work, commissioned for his periodical All the Year Round, Dickens enlisted some of the era’s most famous writers, including Elizabeth Gaskell and Wilkie Collins, to collaborate with him on this Victorian supernatural classic.